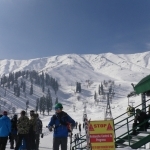 How to go to Gulmarg. It’s a cliche to say, I rip people that do, but for me within white water kayaking, it’s all about the journey and the adventure. Defining adventure can be difficult but I reckon it’s anything where the outcome is unknown. With this in mind you can could have an expensive but adventurous trip to Ikea where you’re not sure what you need! 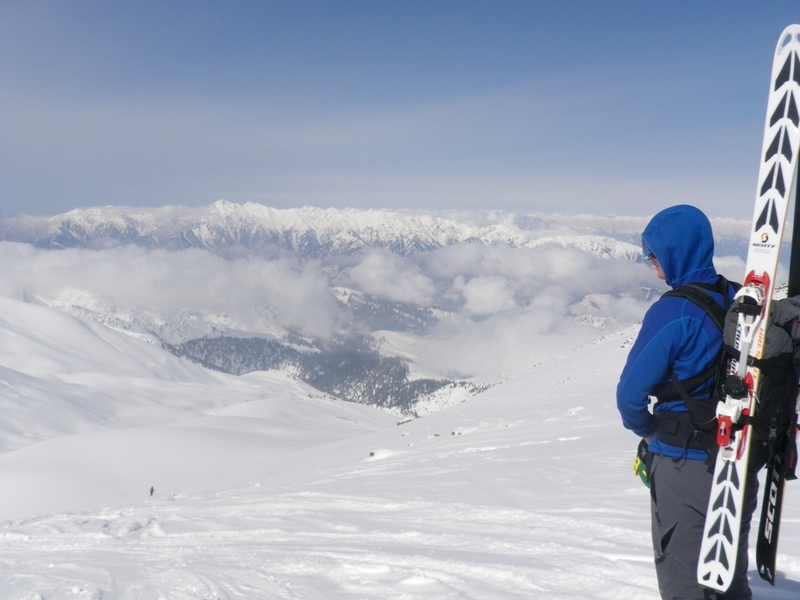 I’ve enjoyed skiing over Europe and would describe myself as average. 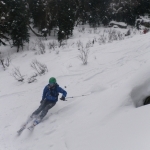 I know a bit about off piste and snow strength etc. 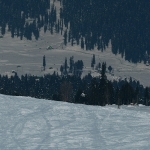 and can zoom down a black without too much trouble but I wanted more from a skiing trip. 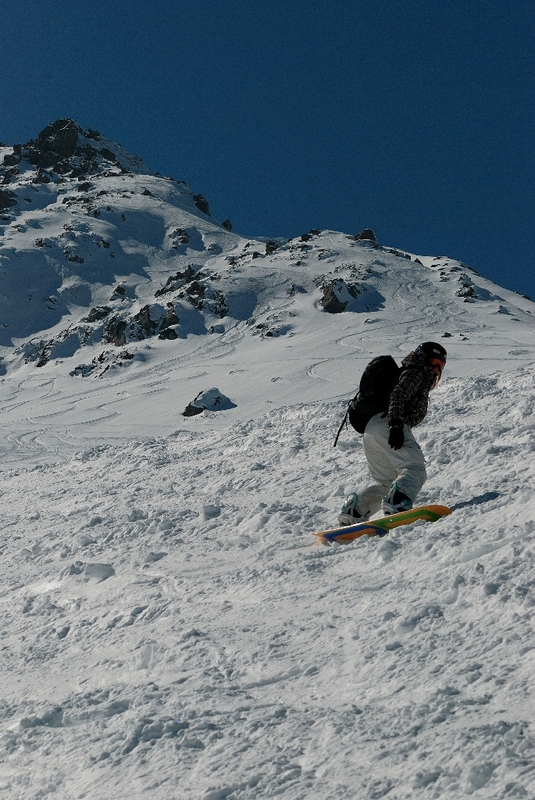 Something where I wouldn’t have to queue at the lifts and share the tracked out mountain with hundreds of others. 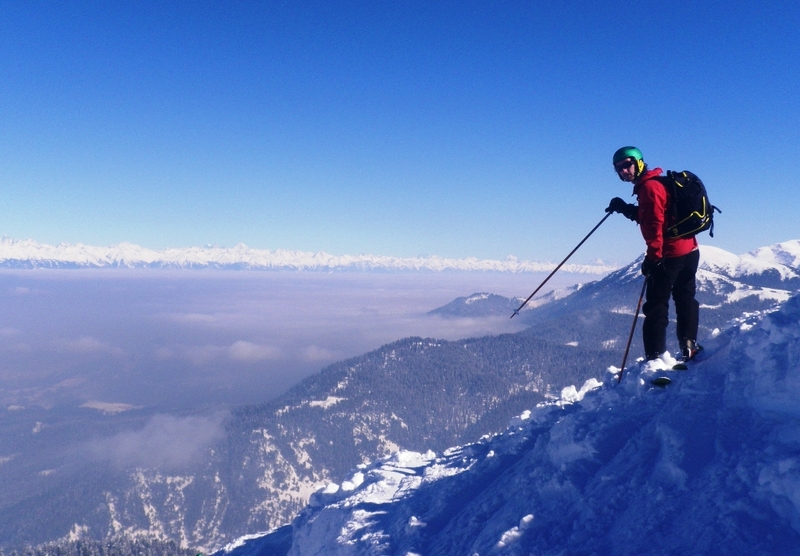 Kay & I were at the Kendal Mountain and watched a video about skiing in Kashmir, where totally hooked and booked flights. Joined by two friends we spent a month in the powder. It’s in the North West of India and on the border with Pakistan. In recent times, it’s been a hot bed of instability both internally and with border issues. The UK foreign office still advise against all travel to the region. Sringar airport is well serviced from the domestic terminal in Delhi as it’s very popular with Indians for a holiday. There are several flights everyday from the major budget operators: Indigo, AirIndia and Kingfisher. 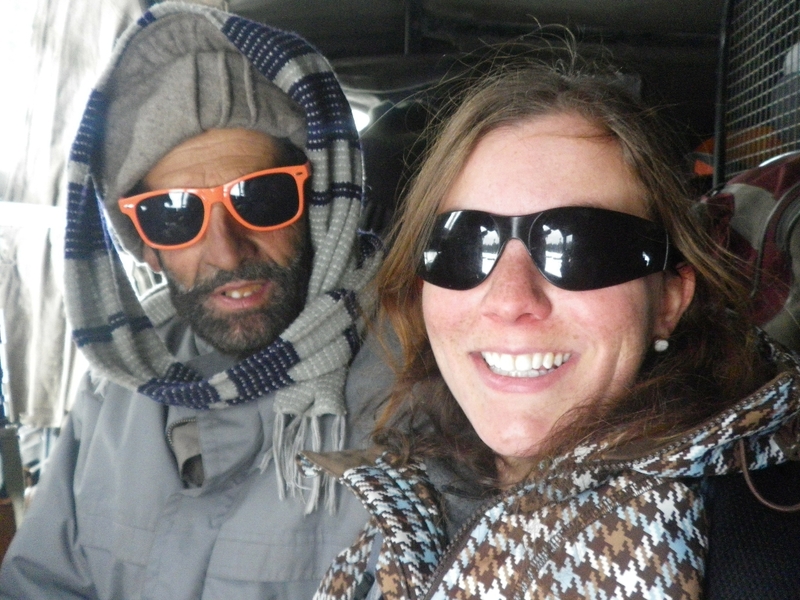 Getting to Gulmarg from Sringar is a fairly short jeep ride. You usually have to change jeeps halfway to cope with the change in road conditions. The town is spread over a large area and its easy to book somewhere in advance that is actually miles from the gondola. We didn’t book anything before we got there and looked around at an array of choices to where to stay. There are a couple of cold and smokey hostel type rooms where a bed in a shared room is pretty cheap. There are also some pretty posh places and some middle of the run hotels. We got a big room with 4 beds, heating, hot water on tap and breakfast for a very reasonable £10 per person per night. For many of the hotels, winter is the quiet season because the number of Indian tourists is low. Summer would be a different story where the hotels are fully booked weeks in advance. 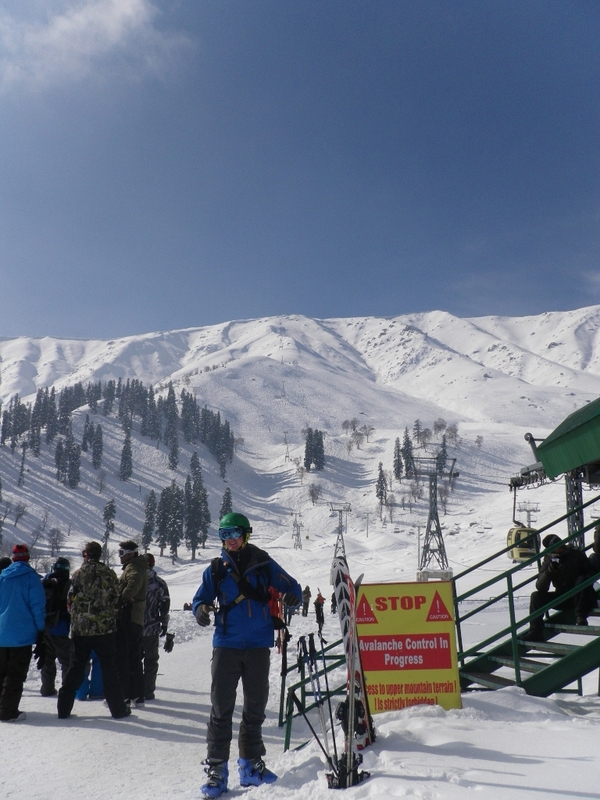 As Gulmarg becomes more popular it might be worth booking ahead but there was plenty of choice for us on the day. Breakfast could be a little hit and miss. The resort is really geared towards Western luxuries such as Nescafe, it was impossible to get Indian ground coffee. They do toast but it’s that sweet loaf, and our place did porridge that was a bit odd. The best was eggs or Puri Baji. We stocked up from the market on lunching goods such as biscuits, crackers and chocolate. There are 2 main places to eat at the mid station offering a range of food that wasn’t massively expensive. I got the best coffee of the whole trip sat outside at the mid station! The Kashmir Kebab was a welcome warmer on the cold days. Most of the hotels offer evening meals or buffets but there are also a few restaurants around the resort to grab a bite. We were there long enough to try many of the restaurants and hotels. One of the best was just off the main road opposite the ATM machine. Avoid eating Pine Place on the safety talk nights, it’s super busy and they just throw out fast, rubbish meals. There’s a couple of places to rent kit. Due to a breakage we had to hire a transciever and it was in good condition. I did get screwed a bit when I had my skis waxed and the first time they just used candle wax and the second totally over charged me. Don’t rely on a great service even if it is done with good wax. 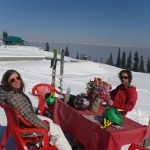 We ran into a couple of traveler that stumbled into Gulmarg on a longer Indian/Asia tour and were able to hire everything including all in one suits. 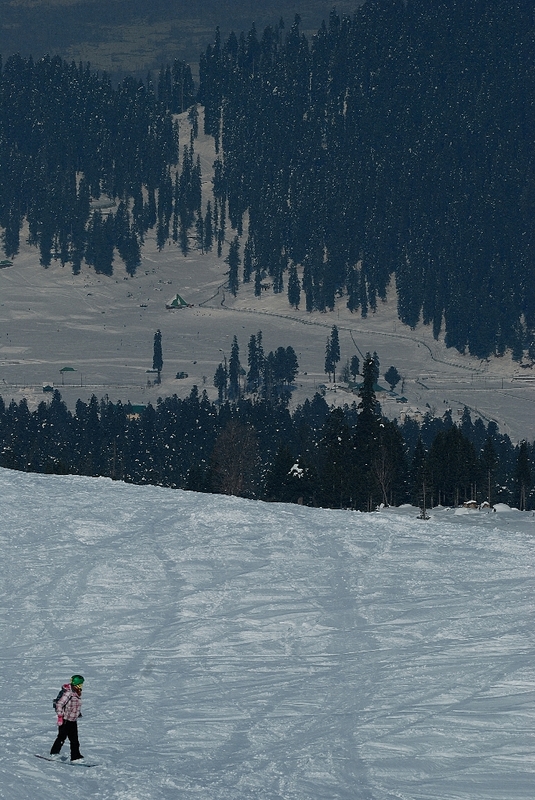 The resort itself is spread around a central bunny slope with a number of drag lifts. Snowboarders are not allowed here at all so our plan to gently warm up with the snowboarding girls was a complete fail. This area was busy with the ski schools, Indians and the occasional Westerner. 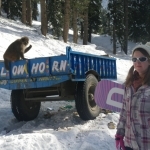 The first gondola takes you up to 3200m to just above the tree line. This gives you access to a number of routes back to resort wherever you fancy. There are a couple of popular lines that are tracked out most of the time but if you are feeling adventurous you can walk/skin right as you travel up the gondola as far as you want and descent back to resort or the military road that runs along the bottom of the slope here and then boot back to resort. From the mid station at the top of the first gondola you can get a coffee but more importantly access the chairlift. This was open far more often than the second gondola to the top of the mountain and became a stable base of activity during poor weather. Again from here there are some simple routes straight down but contouring both right and left you get a number of different lines to drop. 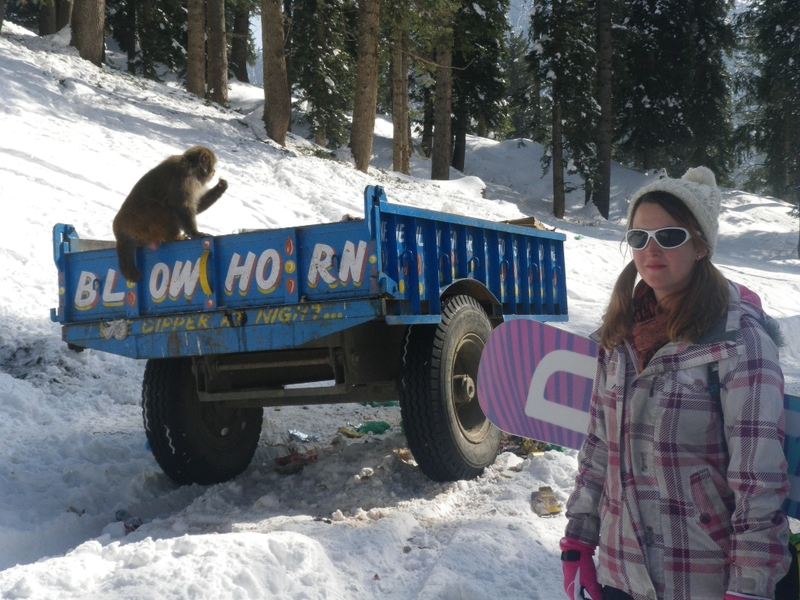 If you contour left for a couple of bowls (taking all the necessary alvanache advice and precautions) you can end up in the Drang Bowl that doesn’t take you back to resort but drops you lower that Gulmarg and you require a taxi ride back to resort. 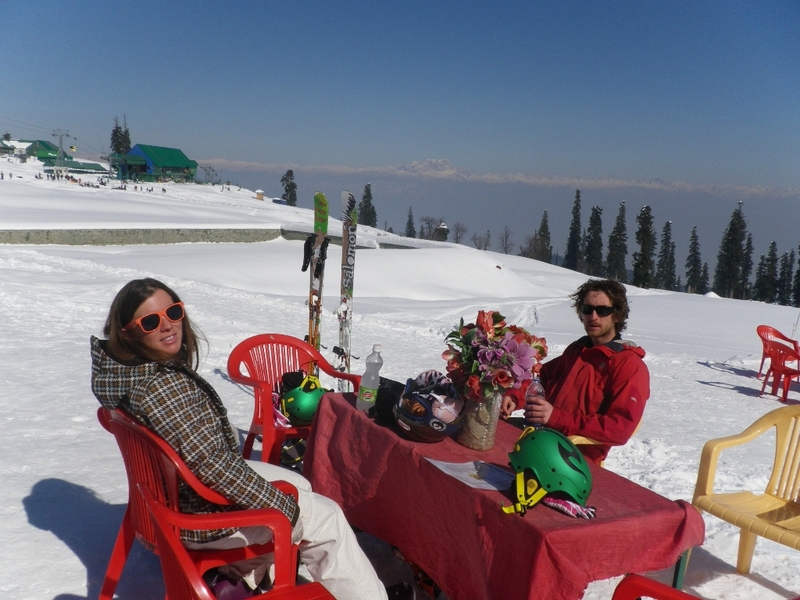 You can ring in advanced but we were not waiting long when we choice to below Gulmarg, just ring a taxi when we were at the bottom for a lift and wait eating biscuits! My favourite lines from the chair lift were to contour right as you go up the lift around as far as you can and then boot up a very short distance to the obvious bulge in the mountain and start here holding a left line towards the trees on the ridge. From here bomb straight and descent through the main gap in the trees back to resort. Once the second phase of the gondola opens, the mountain truly opens up. You really need to know your stuff up here. 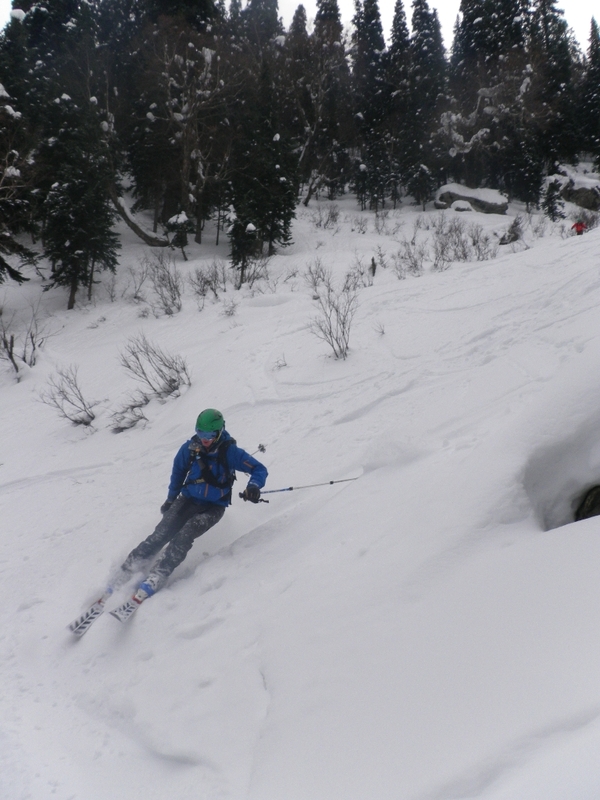 You should know the avalanche forecast for the area, have all the right gear and ski properly. Dropping straight below the gondola is easy fun but the real reward is to boot up to the peak and drop whichever bowl takes your fancy. 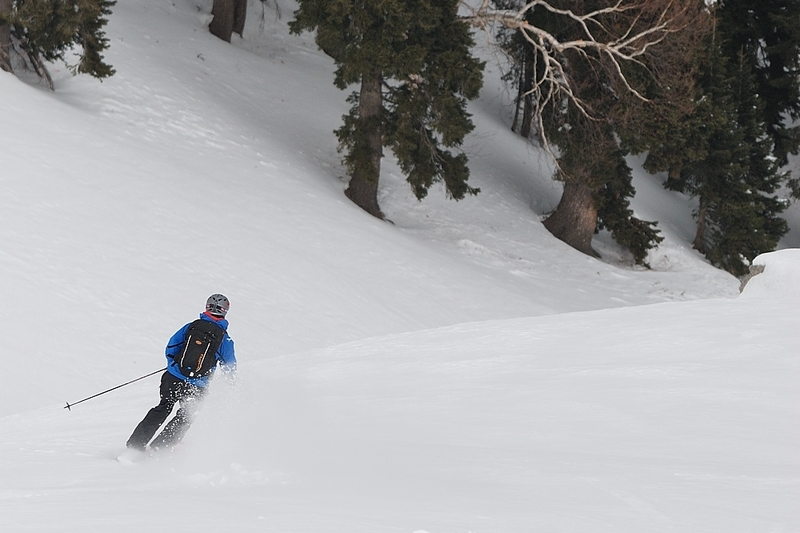 It’s possible to ski down the back and drop the bowls right at the end of the mountain. 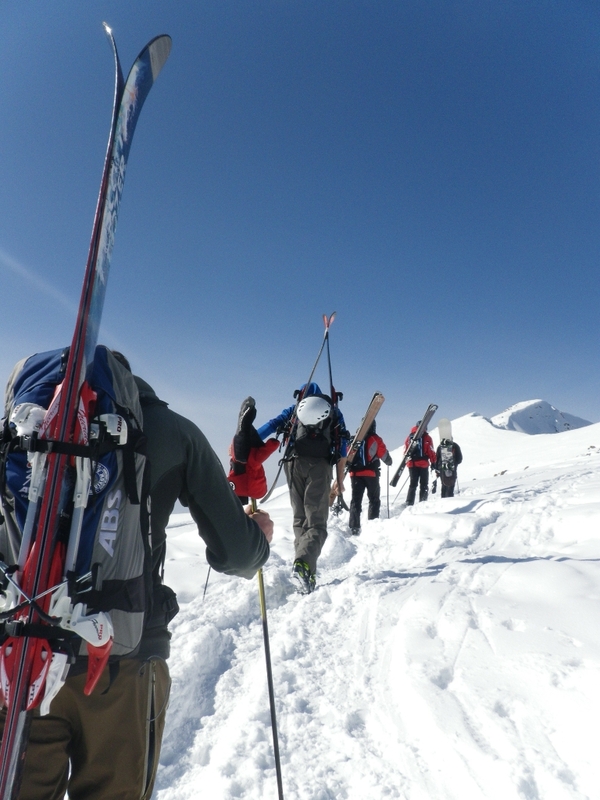 This is pretty much a full day out and requires a long skin or boot and ski down the military road back to town. 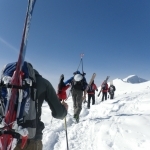 The second phase wasn’t opened everyday, due to various changes in the conditions but mainly due to lack of explosives to make the patrolled ski area safe despite the avalanche rating for the whole mountain being moderate. The explosives are controlled by the military and they aren’t accessable all the time to the mountain safety team. 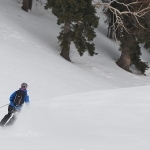 Once this changes, the whole resort will improve allowing greater access to the back country terrain.